Don't miss Cap'n Henry's GREAT Pirate War Game! Bein' as TLAP seems to 'ave past me bye, I'll be makin' up for lost time now. 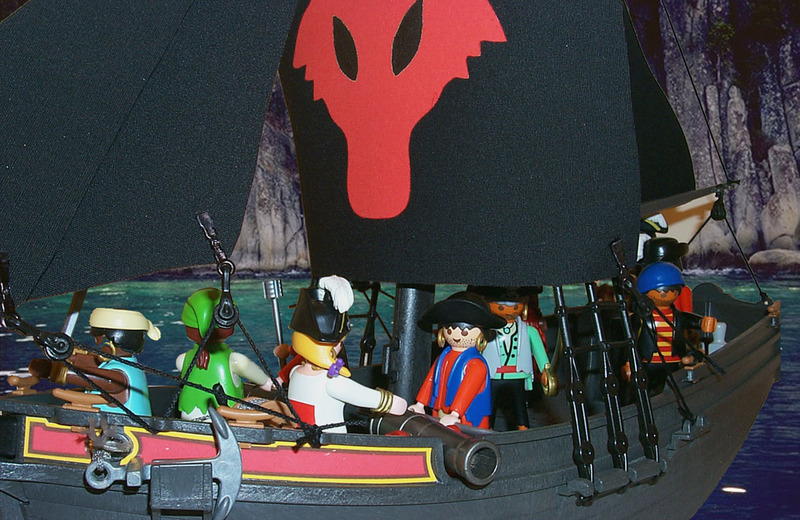 What better way than to share wit'ee these here piccies of a sleek piratical sloop - the Fenris, captained by Lucas Wolfe outta Puerto Plastico, the scurviest port in the Playmoribbean! 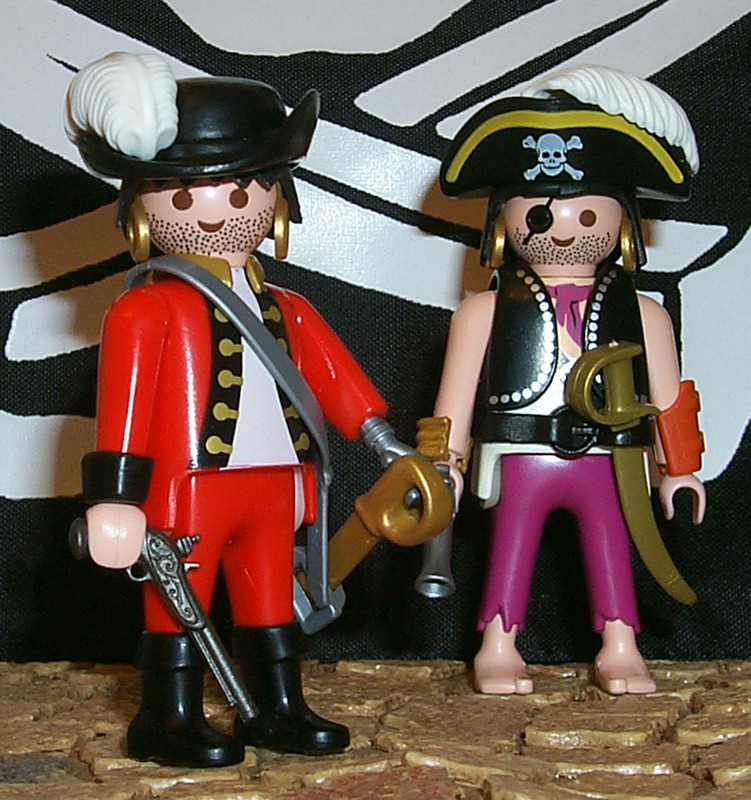 Arrr, the good captain and meself 'ave shared a bottle o' rum or two, and I can tell'ee he's a hard man, 'at he is. He's a fair man too, but a 'ard drinker, 'ard fighter, and 'ard not to like. This be the good cap'n Lucas Wolfe, with his trusty first mate, Erasmus McGee. Wolfe is a fine shot, and 'e likes his pistols like 'is women, fancy. McGee be a fine man wit a blade, 'e is, but he's more likely to harm ye by throwing 'at pistol of his 'an 'e is by shootin' at ye. Here be Wolfe, front and center, and his band of cutthroats. The cap'n waves from the bow of the Fenris. She's 'is pride and joy, she is. A former navy sloop, she was "liberated" from 'is Majesty's service and after a bit o' repaintin' is now the most feared sight in all the Playmoribbean. When ye see the red wolf comin' fer ye, just heave to and let 'er 'ave ye. Wolfe and 'is lads'll take what they want, but if ye don't put up a fight, they'll like as not just leave ye on an island somewhere. But woe to those who try to flee or fight! After laying up overnight in an uncharted inlet, the Fenris sails out at dawn in search of prey. Wolfe guides the Fenris out, en route to 'is favorite huntin' grounds. 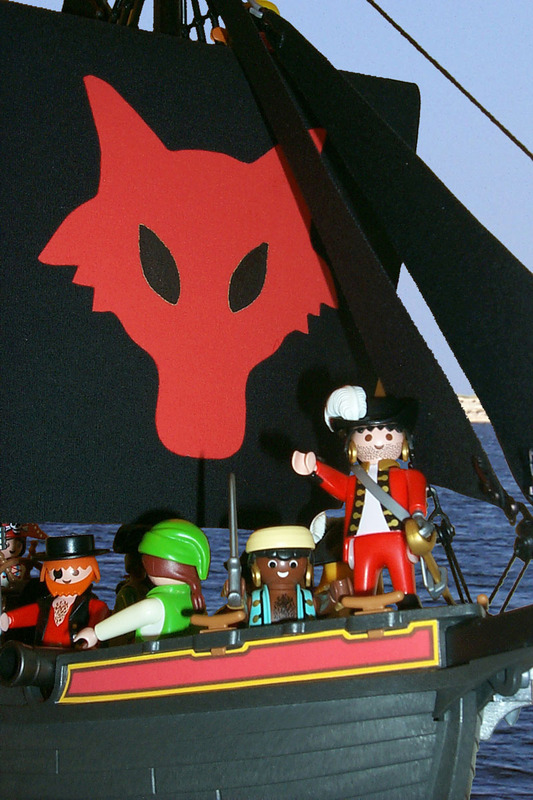 Ye can't hunt what ye can't see, so cap'n Wolfe has two of his most sharp-sighted crew atop the mast keeping an eye open fer vessels. 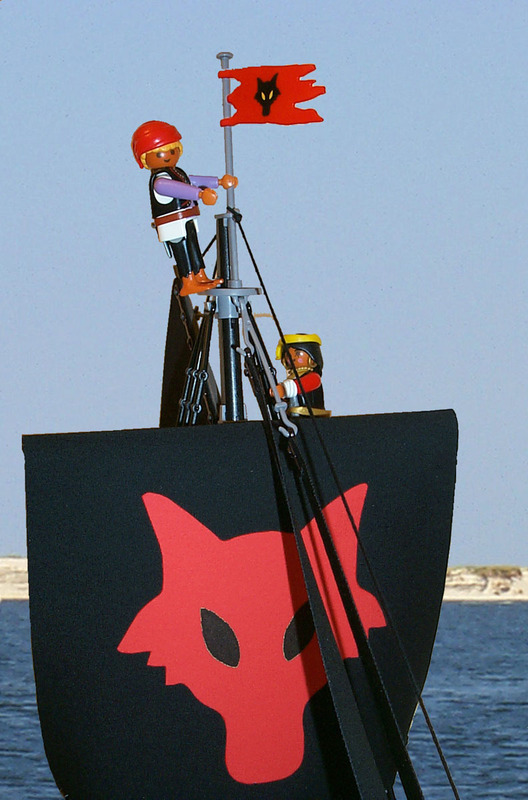 The repainted stern o' the Fenris shows Wolfe's family crest. 'Tis the crest o' the Durand family, to which Wolfe belonged afore changin' 'is name and takin' up a life on the high seas. The Fenris makes 'er way into a grotto where the cap'n and 'is crew hide out when things are a little hot for 'em on the sea. Word around the docks is the navy is sending a fleet o' warships to capture Wolfe and 'is lads. 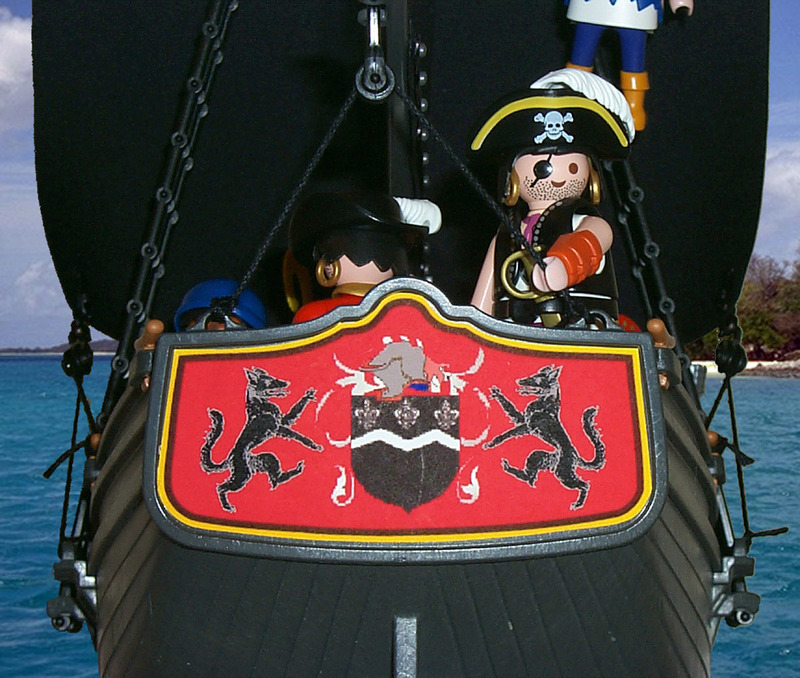 about Cap'n Henry's Pirate Page! 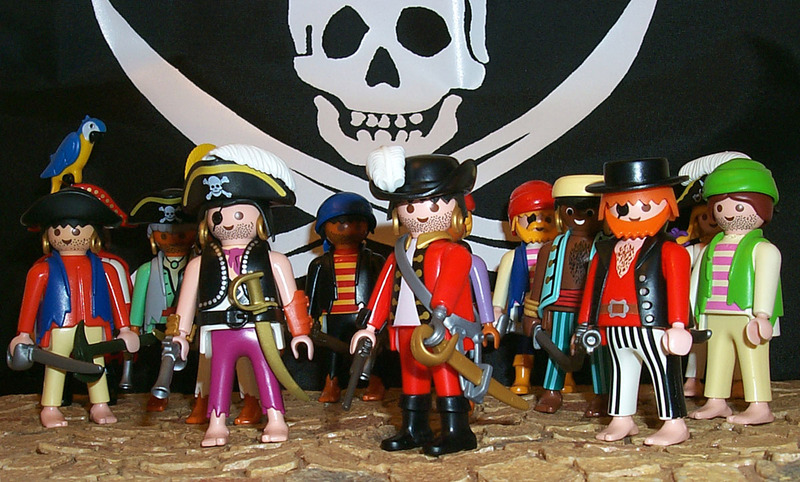 That be a fine crew ye be 'avin thar matey. A most impressive band o'rufians. An 'earty toast ta ye!! Cap'n Wolfe's jacket is a fine specimen. Wouldna mind tha likes of such a glorious ensemble meself. Is it tailored or can it be 'ad from a shoppe? 'e reminds me of another Wolfe, of tha General persuassion, whom I 'ad tha pleasure many years ago. Very impressive ship too. Tha sails do ye much justice. She looks proud in 'er new riggins an paint. 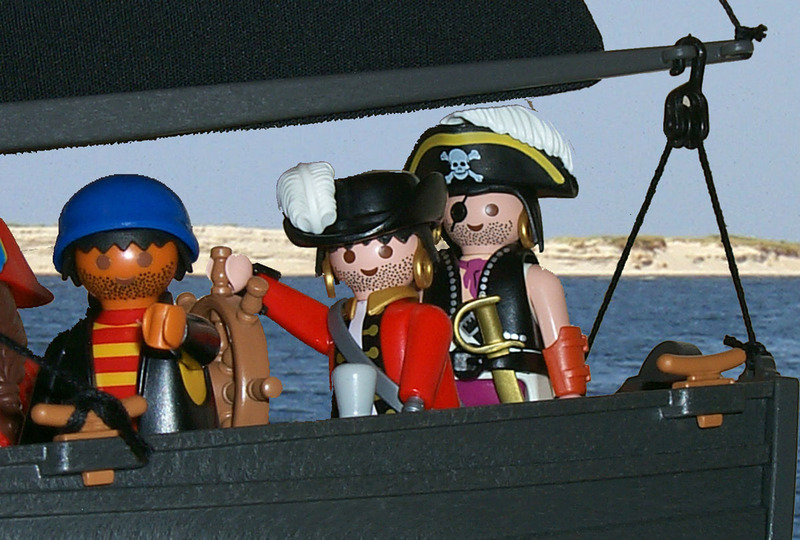 'ave ye time ta spare for a fellow sea dog in discussin some custom sails n stickers? 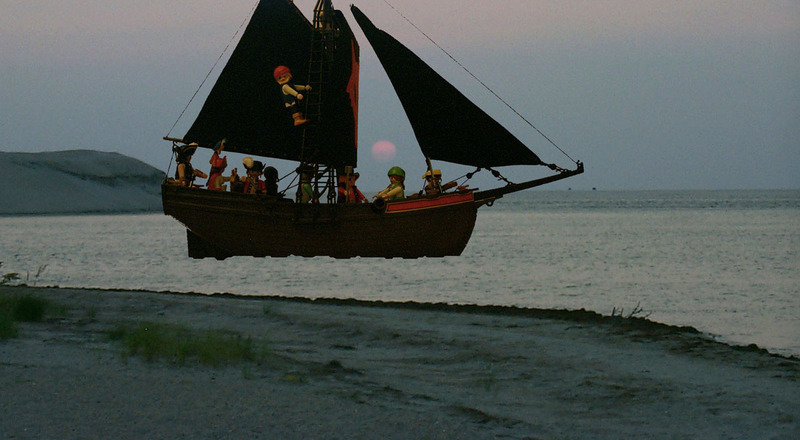 Could be some dubloons in it fer ye Me 'as some plans afoot for such tha likes but nay can find an able sail maker. Tis 'ard ta find such folks in tha prairies. Yer abilities blow me mind and shiver me men at such a fine lookin outfit. Ye 'ave this old sole at a loss fer words. Dispatch me a message iffin ye wish to consult on a plan o'business.